RETRO 64k - Thanks for the Memory! DOWNLOAD MP3 RETRO MUSIC TO TEST THIS MP3 PLAYER! MP3 format, 3:40 mins., 3.4 Mb. This remix is a tribute to Chris Huelsbeck. MP3 format, 4:38 mins, 6.4 Mb. This remix is a tribute to Frank Endler music. MP3 format, 3:11 mins, 2.92 Mb. This is the Demo Song #2 found on C64's Future Composer Music Tracker. 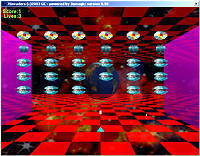 The game is a variation of the Space Invaders game. Play it online! The game is a variation of the 1983 Commodore 64's Gridrunner. Play it online! The game is a variation of the 1981 Vic-20's The Sky is Falling. Play it online! Download cool retro Commodore FONTS here (this website use them! ).